Good except for the noise from the room about. Lots of banging and noise. Beds are from King Koil, they can be purchased via the hotel and delivered anywhere in Australia. Very satisfactory indeed. Pleasant, helpful staff, good sized rooms, well equipped, very clean, nice dining area, good location. Beautiful photos add to ambience. 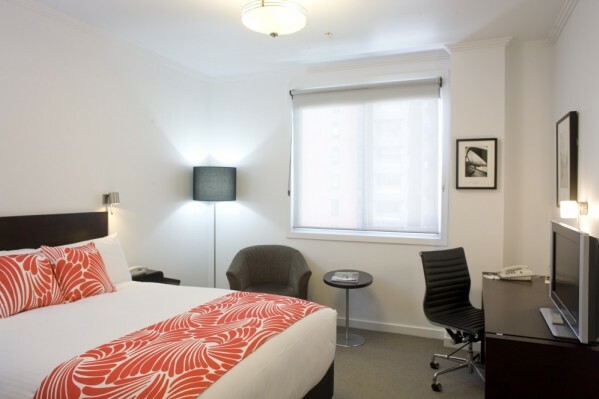 Have stayed at Alto Hotel On Bourke several times and would always stay there when in Melbourne. Very good experience. Very good location, close to Skybus. Trams outside door. Great hotel, with excellent service and a very accommodating breakfast staff; highly recommended and I will return. overall, my partner and I enjoyed our experience at Alto Hotel On Bourke. Reception staff were lovely and our room was clean, and had what we needed to be comfortable. Great hotel. Nice touches in our apartment and all very well thought out. The staff are very courteous and helpful. We were very happy and would definitely stay again and recommend to others. For earlier risers we offer a breakfast basket with your choice of yoghurts, fruit, juice, cereals, breads, muffins and more, that is delivered to your room on the evening prior so that you can enjoy breakfast at any time you choose. For toast and hot drinks a toaster and kettle are placed in all rooms. The free espresso service in the A Lounge can also accessed if preferred. The staff were very helpful, location fantastic, beds - blissful. Had a lovely stay. Excellent room, beds are fantastic and rooms are a good size and well equiped. Excellent value-for-money hotel. Great location! Great location and very quiet at night. Definitely enjoyed my stay at Alto. Great from checkin to checkout. The apartment worked well for our family visit. We found the beds and pillows especially comfortable. Booking was easy, things worked out as planned. Free coffee in lobby is a nice touch. Cleaning service was thorough. We enjoyed our stay and would be happy to return again! We took our three adult kids with us to have a family weekend in the city. The apartment was lovely very quiet area plenty of room even when our sons girlfriend came for a day, we enjoyed every minute We stayed two nights but would have liked more time Fabulous just before the Xmas rush thankyou. All Staff very friendly and helpful was like a big family. however found the bed was hot with "the cloud topper fitted and had to have air con running to sleep. Our very comfortable and deep pillow tops can be removed on request. Very good. Breakfast was excellent - had to choose smaller options as bigger ones were very generous serves. Very good. Nice comfy beds too which is unusual. Most enjoyable, nothing was a bother for the staff. The chocolates on arrival was a nice touch, it was great to have a well cleaned room and the decor of the room was lovely. Also being so close to Spencer St Station was important for us and having a tram stop outside was so convenient. This is the second time we have been guests. The Alto is a good place to stay. It has clean rooms and a friendly, helpful staff. Comfortable rooms; friendly staff; quiet location. The bedroom was clean and comfortable. Sofa in living room was smelly when we checked in on the first day. We did not dare to sit on the sofa for the rest of the stay. Unfortunately, the sound of the tram could be heard distinctly even with both layers of windows tightly closed. This was an issue with my husband, who is a very light sleeper. The location is really excellent and staff was polite and nice. On inspection there is no odor from the sofa. As a precaution we have sanitized and deodorized it. Very Good. All facilities were available and well maintained. Perfect location. Staff very helpful and accommodating. V happy with our stay, will definitely recommend to our friends and family! Our room was a peaceful haven after our early start, flight and a day in the city & it was lovely to have a 'welcome back' note in the room on arrival. I was amazed last time how quiet the room was given the traffic & other transport near by. I recently stayed in Perth at a property that should have had double glazing because of it's proximity to two major highways. The Alto staff were lovely & very helpful, breakfast was good and the massage chairs were relaxing. The location of the hotel is perfect for access to the city & the airport. Finding a room & booking through the hotel's website was easy. Unfortunately the room occupants above or next to us were clearly audible until about 11pm. The fridge in the room was making banging noises when the compressor was running & this woke my daughter & I a considerable number of times through the night - a noise that we had not noticed through the day with other day to day background sounds. As a consequence, we both slept in & were woken by the cleaning staff in their store room next door. Overall, we had a lovely couple of days in Melbourne & the Alto was a significant part of that. Thank you for the comments. We have already tested the fridge but will conduct further investigation. We have also spoken to our housekeeping team with regard to being more cautious in the store room as noise may travel into the one adjacent room on each floor. An excellent relaxing place to stay. Peaceful and ideally located. Friendly helpful staff. The idea place to stay in Melbourne. Alto staff are absolutely wonderful. No request is too much trouble and they go out of their way to make your stay memorable for all the right reasons. The hotel's amenities are first rate and its location is ideal for those wishing to investigate all that Melbourne's CBD has to offer. We will certainly be back - the Alto is our favourite Melbourne hotel!! A special mention for the service provided by Amy and Gemma - their blood is worth bottling. Thank you for reporting lighting issue which has been fixed.